Every day we get new evidence that physicists are just like us: hungry. Physicist Frank Crawford noticed a strange, musical effect when he stirred a packet of hot chocolate mix into his water. Find out about the physics he discovered behind this odd, shifting sound. 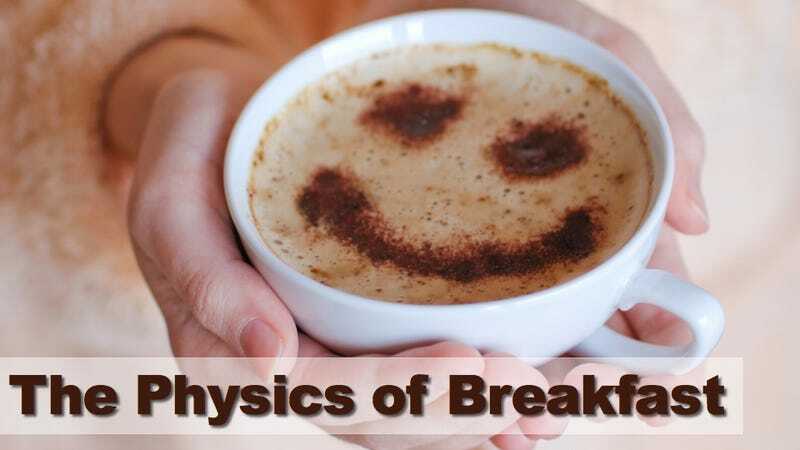 There is an astounding amount of physics centering on breakfast. The Butter Side Down Effect covers toast. The Brazil Nut Effect takes a look at breakfast cereal. The Cheerio Effect looks at . . . a different kind of cereal. The Coffee Ring effect takes into account the nation's drug of choice. And in 1982, the American Journal of Physics published the work of Frank Crawford. He had turned his attention to instant hot chocolate, and what happened when it was mixed into water. What is the "coffee ring effect," and how can you stop it? Every coffee cup vibrates at a certain frequency when it's struck with a spoon, giving off a specific tone. Filled with water, it vibrates at a different level and again gives off a specific tone. Add some powdered hot chocolate, and the tone drops. As the powder dissolves in the cup, the tone rises again. Why is this happening? Crawford's explanation is simple; bubbles. As the powder is shoved down into the liquid, it brings with it a few bits of air, clinging to the different grains. Stirring, to mix in the powder, also mixes in the air, and changes the liquid, just slightly, into a kind of foam. The foam slows down the speed of sound. The frequency at which the mug vibrates depends on the speed of sound. Slow down the sound, and the frequency drops, making the sound lower. As more of the powder dissolves in the water, and the stirring continues, the air bubbles are abandoned. They float to the top of the cocoa and pop, re-joining the air. As fewer and fewer air bubbles are in the liquid, the speed of sound through the liquid increases, the frequency increases, and the tone gets higher and higher. Via Physics.org and the AJP.